Update: There is a far easier way to accomplish the task. 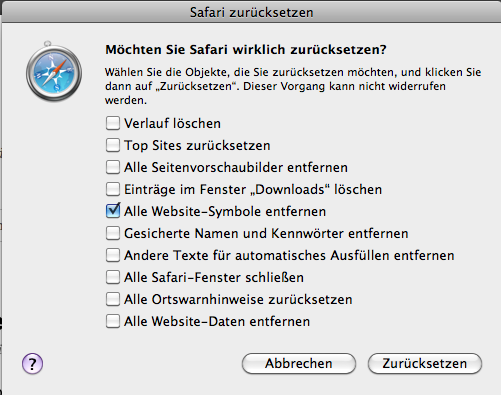 Just go to the „Safari“ main menu and go to „Safari zurücksetzen“/“Reset Safari“ and check „Alle Website-Sybmole entfernen“/“Remove all website icons“. Check/Uncheck all other options you want to perform. Click the OK button. That’s it. If you are a webdeveloper or -designer you probably have created favicons in the past. And as the rest of the site develops in a continuous process, your first created favicon isn’t probably the last version. While Browers like Firefox recognize a change of a site’s favicon Safari doesn’t. It caches the icons. So I want to show you a quick-and-dirty way of getting rid of old favicons forcing Safari to request the latest version from your website (and others). It’s a good idea to restart Safari now. That should be everything. If someone has an idea how to do it under Windows or other Mac OS versions feel free to comment. 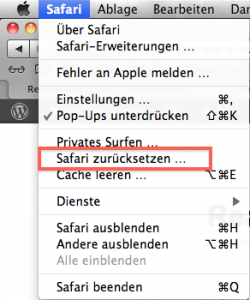 Dieser Beitrag wurde in Tools veröffentlicht und getaggt cache, favicon, Safari, SQLite. Ein Lesezeichen auf das Permalink. setzen. 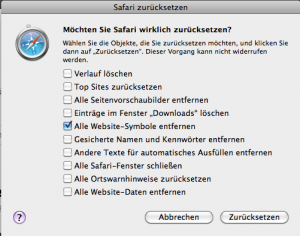 Kommentieren oder einen Trackback hinterlassen: Trackback-URL. Damn … looks like that’s gone now. Thanks for the notice. Which Mac OS X Version do you have? I’ll try to have a look on it. Meanwhile you could try the sqlite commands I’ve mentioned here. Would be interesting if this works. Although the other commands seem to work, but there are no effects on my Safari Website Icons.